On cast slightly domed spreading foot applied at intervals with oval and rectangular enamelled bosses decorated in scarlet, blue and white, with scrolls and strapwork, and prick-engraved with scrolling foliage ornament, the cylindrical lower part of the stem between beaded bands and rising from plain band with four double scrolls, and enamelled with similar oval bosses, the vase-shaped stem similarly decorated, the plain detachable bowl engraved with cross fitchée, pricked with scrolling foliage and partly enclosed with alternate plain vertical straps and straps with enamelled ovals and circular bosses. 1913 Bath House Inventory, p. 129, no. 644, in the safe. 1914 Wernher Inventory, p. 85, no. 428. C. Oman (The Golden Age of Hispanic Silver 1400-1665, London, 1968, fig. 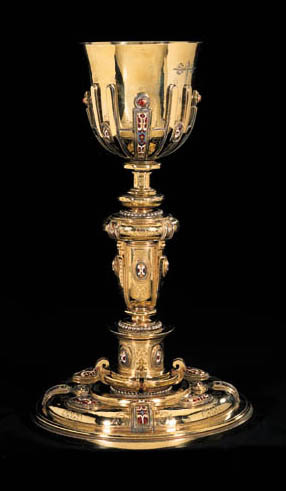 238) illustrates a gilt-bronze chalice with enamelled and silver bowl dated 1628, of similar form. The red and white enamel decoration is typical of Madrid workshops of the early seventeenth century.